I coach busy entrepreneurs, couples and, individuals to unleash the potential within them and find answers to the Life’s Biggest Choices! Together we will construct the life that you wish to live. Ashley has more than 15 years of global experience and obtained her Masters in Psychology in 2011. She started her spiritual journey by taking part in Jose Silva and Chopra trainings. Ashley has developed a unique technique in coaching individuals by combining both worlds of science and spirituality. 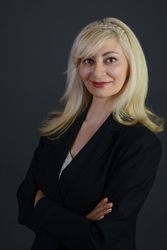 She works with clients across cultures and speaks English, German and Farsi. Since 2000, she has founded a boutique lifecoach-consultancy in Zuerich in Switzerland and offers workshops to companies and individuals. Have you worked with Ashley? Tell your friends! Working with Ashley has saved me from my second burned-out. I have gained a helicopter view of my situation and with suggested changes, I made in my life, I was able to overcome my depression and after only 7 months I am living the life I have imagined. I have just signed up a new contract and in a healthy relationship with my past. What I appreciate the most is the personalized booklet I have received which works as my personal navigator in my life above all respecting my privacy. - Business Owner in Switzerland Name is privet. Is it to late to achieve my desired life? Achieving your desires is absolutely possible you just need the assistance to feel empowered and to take the next steps.